So, I said I would be sticking around for awhile and then I don’t post for weeks. Wish I had a great excuse other than I just didn’t make the time to post. But I don’t. I baked – not the required recipes, mind you. For various reasons, the recipes for this month haven’t been completed but my slackerdom has given me a wealth of backlogged recipes to choose from. Apologies to the recipe selectors this month. Who knows? I may be linking to you in six weeks when my stars align. Not a big hit in our house. I took it to work and – even though I was sure to label it CORNMEAL – some just didn’t get it. When someone expects a moist quick bread but bites into this, you’ve lost them already. For the record, I liked it but I alone cannot a loaf finish. Will loved these. LOVED these. I have been serving them to him as breakfast this week and he has been eating one after dinner too. Can’t get a better review than that! In her introduction, Dorie said these were the result of a mistake. They were supposed to be muffins but turned into cake. Following the general idea that sometimes life really does force you to make adjustments (often when you least expect it), I turned these back into muffins. 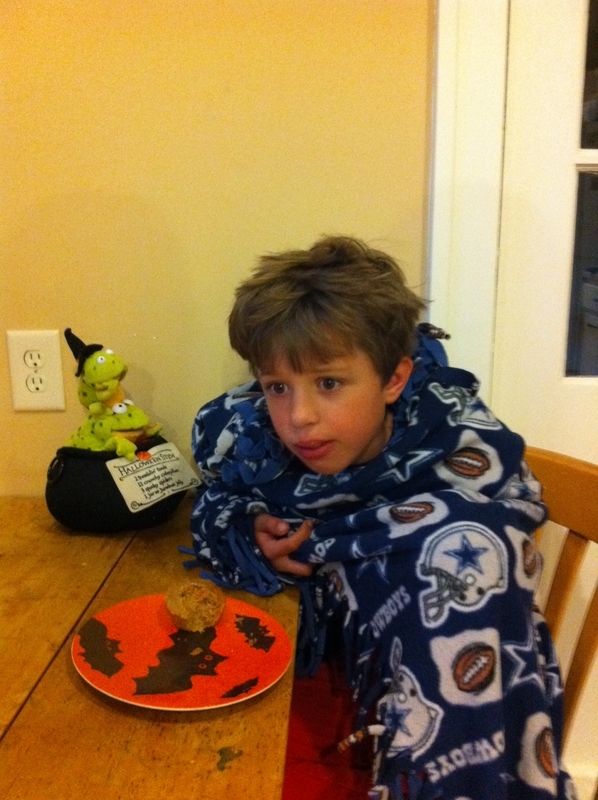 Will is the only taste tester so far but he gave them an A+++. What better endorsement do you need? Recipe is at Baking and Boys. Yup. I am still around. I have been lurking a bit but not baking much. If I start relaying how crazy this summer was and how I never meant to take an extended break, I probably won’t stop for 37 pages and we still won’t have discussed TWD. While lurking, it came to my attention that TWD will be finished by the end of the year. I started baking along in April 2008. That is a lifetime ago in some respects (and about two weeks ago in others). The point is…it’s a long time to bake along and not finish. So, I am finishing. I wish I could say that I had today’s flip over plum cake to report on but we ate all the plums in 2.6 seconds. I will make it though, along with a few others I missed, and, if all goes according to plan (hollow laugh), I will even post about it. 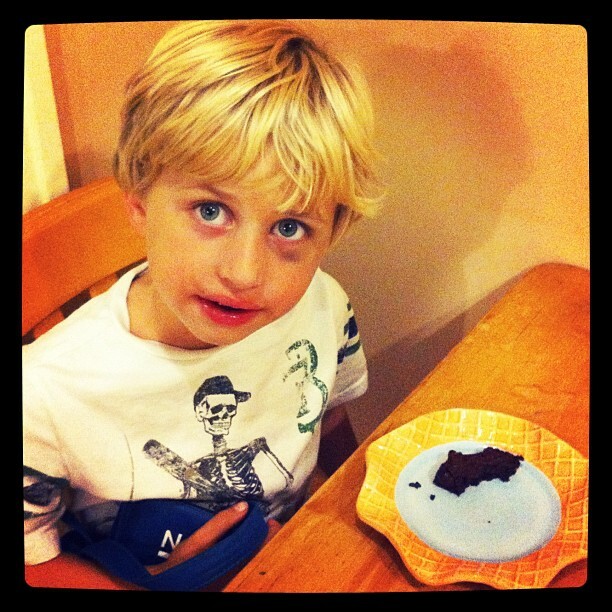 For today, I can report that Colin (above – shiner courtesy of playground roughhousing) and Will enjoyed the classic brownies. I tried a small bite but not enough to make a definitive conclusion about them. 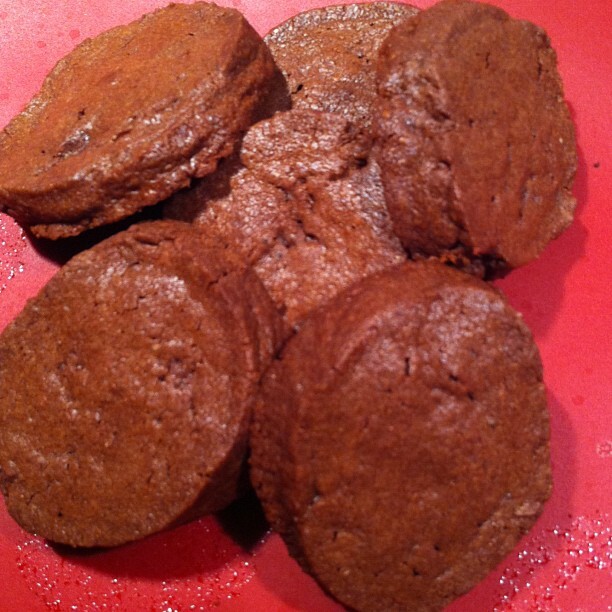 They seemed dandy but Dorie has enough good brownie recipes that I probably won’t go back to these soon. I also made the salt+pepper cocoa shortbreads. Salt+pepper+sweet is exactly the kind of weird food I love. I, therefore, could only make half a batch and immediately took all but one to work. If they hadn’t been shortbread (eh), I probably would have devoured them in the car on the way. What I tasted I did like and will probably crave until I breakdown and make a bowl of dough and eat it standing at the kitchen counter. All pictures will be iphone photos now officially. The incredible “hassle” of downloading photos has thwarted more than blog post in my past. So, I officially give in to my laziness. I am really going to make an effort to be back next week and the week after that. Get used to me folks. I am sticking around for awhile. 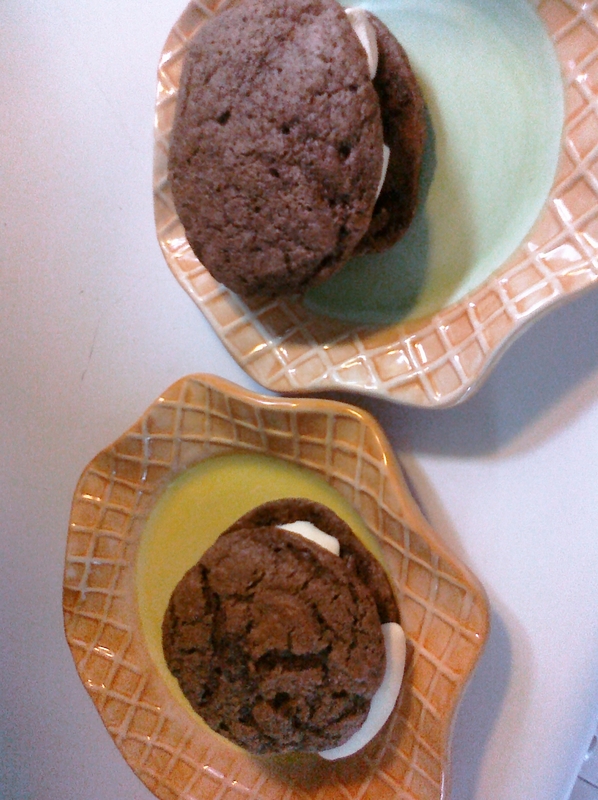 Sour Cream Chocolate Cake Cookies: After reading the P & Q, I decided not to offer these without a filling. I made two ice cream sandwiches for the kids. Hmmm…I tried one and didn’t go back for a second. Will ate his but didn’t ask for a second. Colin ate three bites and walked away. Not a hit around here. The chocolate flavor was just too weak, I think. Date/Nut Loaf: Didn’t get to it. I just knew it would not be well received around here and I am not in a position to be the office baker at the moment. Chocolate Biscotti: I got pretty small cookies. They were good. Biscotti is not really my thing but I was curious about the chocolate. I did take the rest of these to work and they flew off the table. 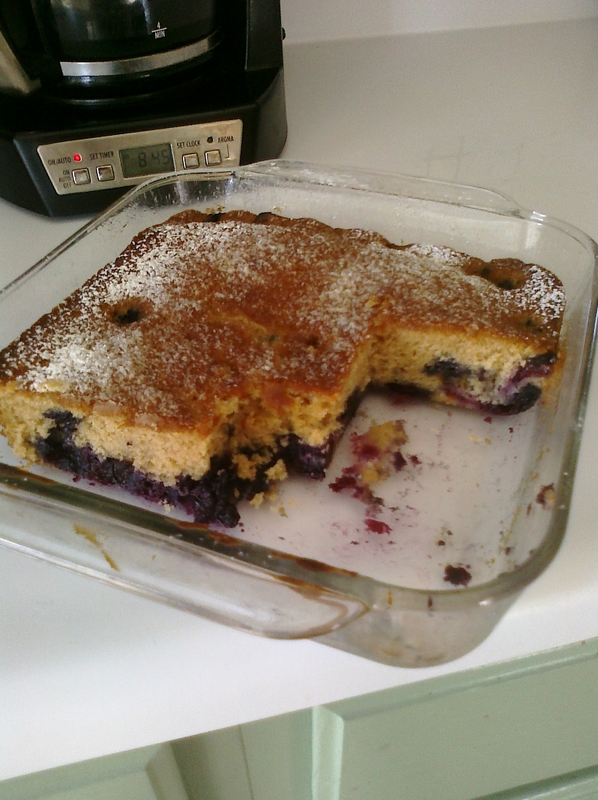 Blueberry Plain Cake: I was originally planning a post comparing this to the Oatmeal Nutmeg scones but, alas, that didn’t happen. In short, we liked this but ended up not quite eating it all. I can’t really tell you why. Seemed like the perfect breakfast cake to me but maybe (subconsciously for some) we are trying to eat healthier breakfasts. 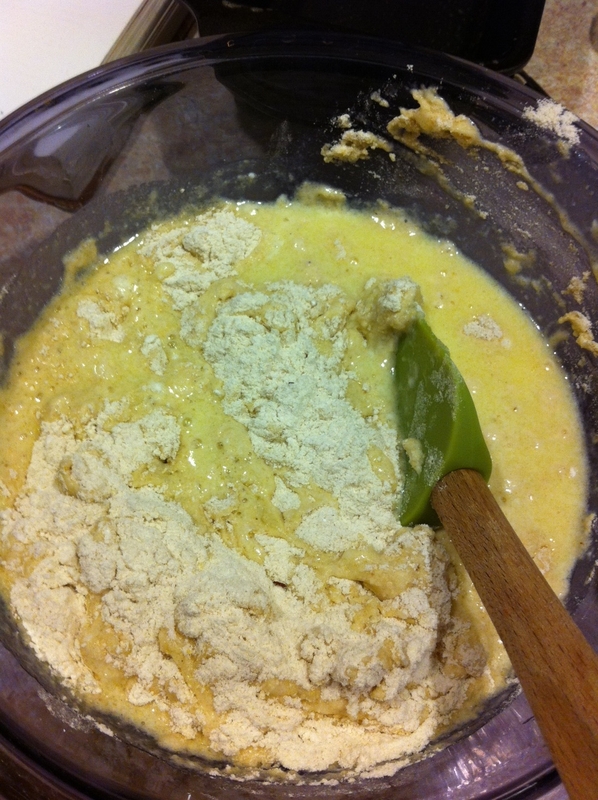 Oatmeal Nutmeg Scones: Dorie’s scones and I are not friends. Period. I am typing this from my husband’s office at 8:18pm KC time. Why? Because someone decided to call us for a showing from 8-9pm. You might think sane people (parents, even!) would say no to such a request. And, in theory, I wholeheartedly agree…but when you are keeping your house unnaturally clean despite your family’s innate desire to do otherwise and have lost track of your “home improvement” expenses, you take the showing. You never know when this may be the one that pays off. So, here we are killing time when we should be winding up for the night. OF course, this means I am on his computer and have not loaded my one picture of these biscuits. 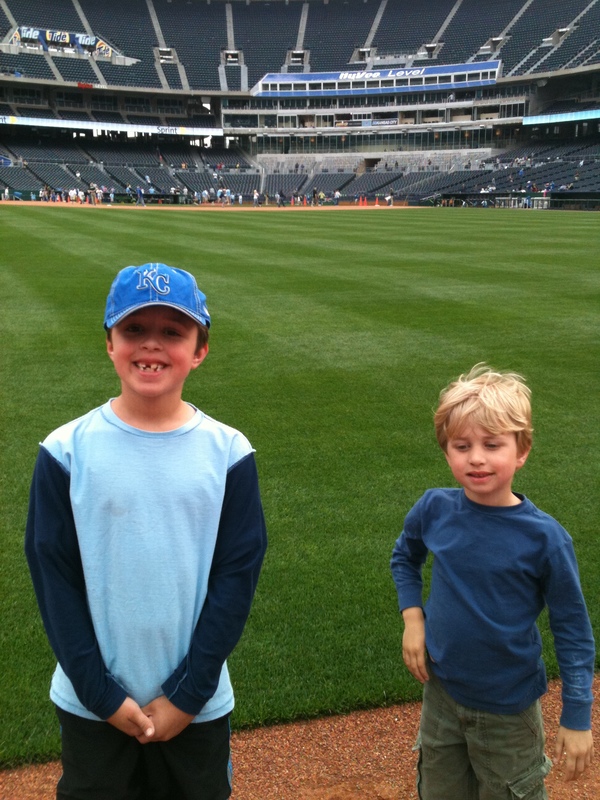 You get my kids at the Royals game which I found on his laptop. I did make them. We did eat them. In fact, I may have eaten one too many the next day rationalizing that they had to be eaten then or be thrown out. I liked the maple flavor but not enough to make these again. I like the flaky softer biscuits out there. 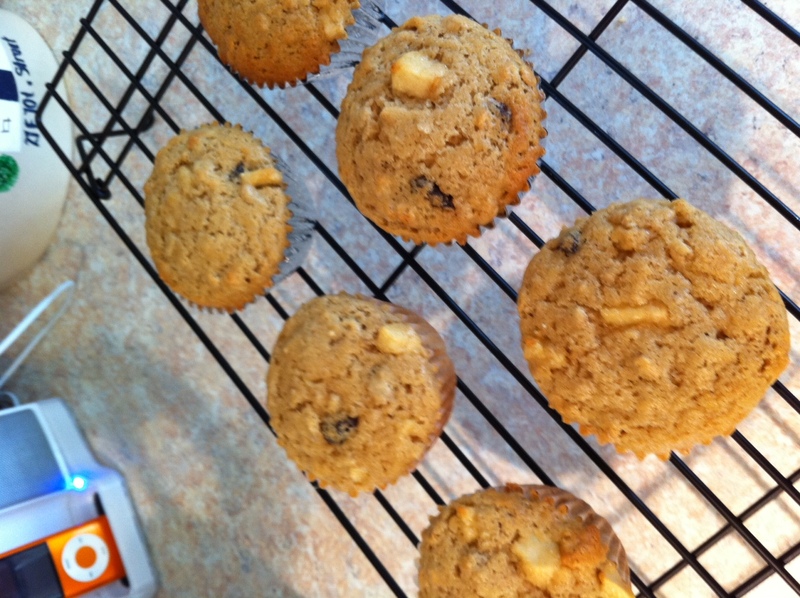 The recipe is at a little something…sweet! 1. Bundt pans are a b***h to butter/flour. 2. Bundt pans are a b***h to wash.
3. Therefore, all bundt cakes must be judged on the ratio between tastiness and #1 and #2. 4. This bundt cake mostly succeeds (1.5 to 1?). It is wonderfully moist and sweet. I used two apples and raisins instead of the pears/prunes. In future, I think I would stick more apples in or maybe even some cinnamon. I wanted the other flavors amped up a bit. 5. BUT, my mother loved this cake. And this is an important “but” because I served it on mother’s day. And a mother’s opinion? Overrides a lot, right? 6. Full recipe at Pantry Revisited. 1. I planned to make the orange/chocolate loaf. 2. I didn’t have enough chocolate. 3. I did have enough semi-sweet chocolate chips combined with leftover Andes mint chips. 4. So, it was sort of a half-a** mint chocolate version. 5. my mom loved it and ate a lot of it. 6. Why didn’t I just go to the store to get the proper ingredients, you ask? Because we put our house back on the market. Yup. We have lost our marbles, thanks for asking. 7. PS the cake was good. That is all.